Hong Kong’s MTR Light Rail system is something I have written about previously, due to it being one of the more interesting places for a railfan to explore. 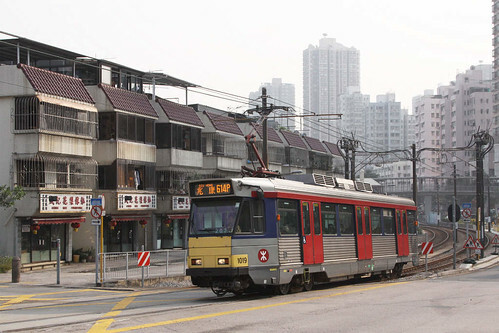 Located in the north-western portion of the New Territories, the Light Rail forms an important part of the local transport network, running through the New Towns of Tuen Mun and Yuen Long to the ferry pier and railway stations that connect them to the rest of Hong Kong. A unique feature of the Light Rail is the numerous level crossings, which unlike the slower moving Hong Kong Tramways, require motorists and pedestrians to share the road with fast moving light rail vehicles. For these reasons when the Light Rail system commenced operations in 1988, a series of public safety advertisements aired on Hong Kong television to raise awareness of the safe way to behave around the new mode of transport. First up is this advertisement featuring stop-motion animation, depicting the traffic signals that face motorists and Light Rail Vehicles, and illustrating how to behave around the intersections. If the Cantonese voiceover in the last video was unintelligible to you, then this advertisement should be of some use. As well the synthesiser backing track, this clip also features plenty of footage of the original orange and white LRV livery. The final two commercials take on a more instructional note: the first one is aimed at motorists, while the second one is for pedestrians. This entry was posted in Transport and tagged Hong Kong, KCR, Kowloon Canton Railway, light rail, Mass Transit Railway, MTR, New Territories, railway, railway signalling, television commercials, trains. Bookmark the permalink. I know of one such video that features tram 1013,which crashed in 1994 and was scrapped.